Richard Wilkes was born at Wolverhampton on 12 October 1882. I found this date on the Cartledge Family Tree on the ancestry website. At the time of the 1891 Census he was living at 26 Waltho Street in St Marks ward with his parents, father William, age 33. occupation described as Hay Trusser and mother Matilda, born in Dawley, Salop who was 34, and his siblings William age 6, Arthur age 4, and John age 1 year. By 1901 Richard was an 18 year old commercial clerk, still living with his parents, but the family had moved to 317 Hordern Road in Dunstall. William, 16, was an Apprentice Carpenter, and in addition to Arthur age 14, and John 11, there were now 3 girls, Ethel age 9, Annie M age 7, and Rose L. age 3. At the time of the 1911 Census Richard was living at 23 Hordern Road as the 28 year old Head of the household, whose occupation is described as Stock Clerk at a Brass Foundry and Manufacturer, with his brother Arthur age 24, who was a Locksmith and his sister Rose who was 13 and at school. Emily Mary Hobley was also living at the house as a co-occupier. She is age 42, single and a Dressmaker, born in Rugby. I wondered whether as he was now the head of a household, Richard’s father had died, and I have found on freebmd the death of a William Wilkes of Wolverhampton, age 49, registered in Wolverhampton in the Quarter to June 1907. I could not trace his mother Matilda Wilkes on the 1911 Census, so I looked to see if she might have re-married, or indeed died, but I haven’t traced anyone recorded who looks likely to be the same person. There is no trace of Richard Wilkes being married, so he was probably a single man when he signed up. This was in Wolverhampton, according to the East Lancashire Regiment records. I searched for his military records via the findmypast and Ancestry websites, but with no success. The website http://www.greatwar.co.uk/research/military-records/british-soldiers-ww1-service-records.htm tells us that ” There were about 6-7 million soldiers (Other Ranks and Non-Commissioned Officers) who served with the British Army in the First World War. Each soldiers’ record of service was stored by the War Office after the First World War was over. Unfortunately about 60% of the soldiers’ Service Records were irretrievably damaged or lost completely as a result of enemy bombing in 1940 during the Second World War. The exact number of serving British soldiers is not known because of the loss of the records. Approximately 2 million were saved from destruction. These records are known as the “Burnt Records”.They are classed as WO 363 records, the reference number given to them by the National Archives. The “WO” in the classification code stands for “War Office”. As a result of the loss of so many of the First World War Service Records, there is now only a 40% chance that the Service Record of the individual you want to trace will be available to examine. I have searched the National Archives (NA) catalogue, and found that Richard Edwin Wilkes’ Medal Card is held there. From my previous experiences with Medal Cards, this will have only his name and Army number. 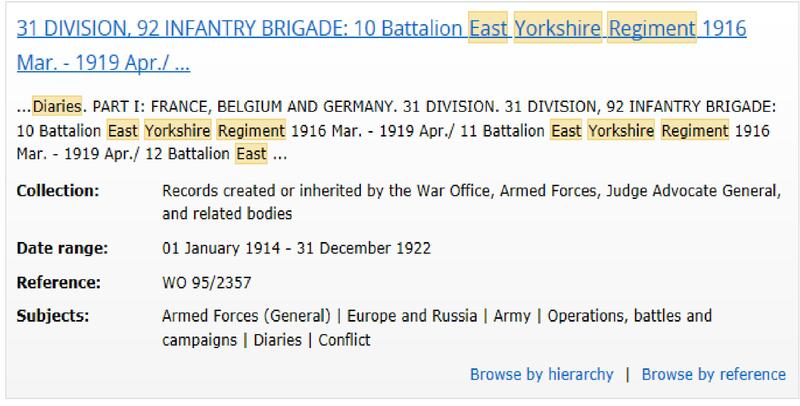 However, as you can see from the screen print below, they do have the Diaries for the East Yorkshire Regiment. A visit to inspect these Diaries is on the agenda, though I understand that diaries are unlikely have information about particular individuals. British fake tree used by snipers and spies. “The Germans had the advantage of having many times more telescopic sights than we did, and bullet-proof steel loop-holes. Also a system by which snipers were kept for months in the same sector until they knew all the loopholes and shallow places in our trenches, and the tracks that our ration parties used above-ground by night, and where our traverses occurred and so on, better than most of us did ourselves. Richard is buried at the Arras Memorial so he must have fought and died at the Battle of Arras. Our Wolverhampton man Richard Wilkes was just one of the men killed. The figures are chilling:- Third Army casualties were 87,226; First Army 46,826 (including 11,004 Canadians at Vimy Ridge); and Fifth Army 24,608; totalling 158,660, based on the returns made by Lt-Gen Sir George Fowke, Haig’s adjutant-general, whose figures collate the daily casualty tallies kept by each unit under Haig’s command. I have searched the microfilmed copies of the Express & Star, Wolverhampton Chronicle, and the Midland Counties Express (MCE) but there is no record of Richard’s death that I could trace. The MCE publishes a regular feature called “Our Pictorial Roll of Honour” which is worth looking through if you are trying to find a picture of one of our local fighting men, but, sadly, I could not find one of Richard Wilkes. This article was prepared by one of our volunteers, Ann Eales. 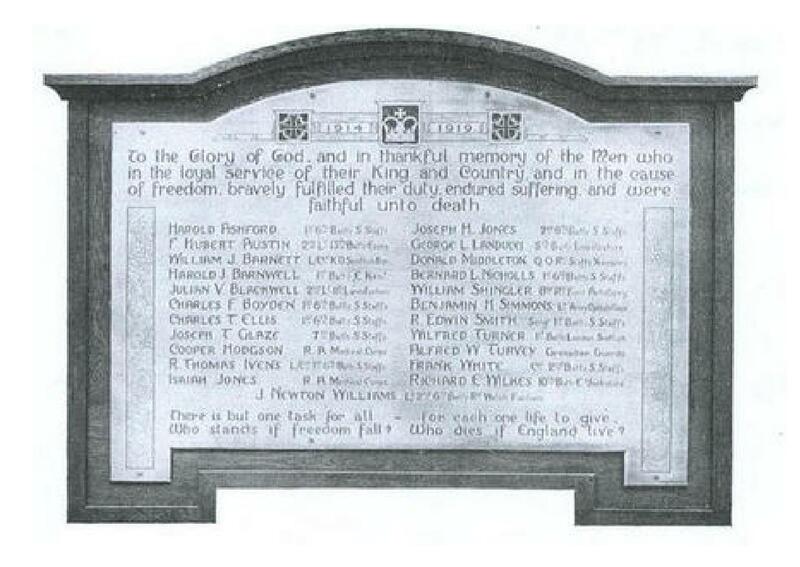 The Newhampton Road (Cranmer) Wesleyan Church Memorial and Roll of Honour, see picture, includes in alphabetical or der 172 names of men and women who served during the First World War, including Wilfred Turner. You can read an interesting story about this Roll of Honour. 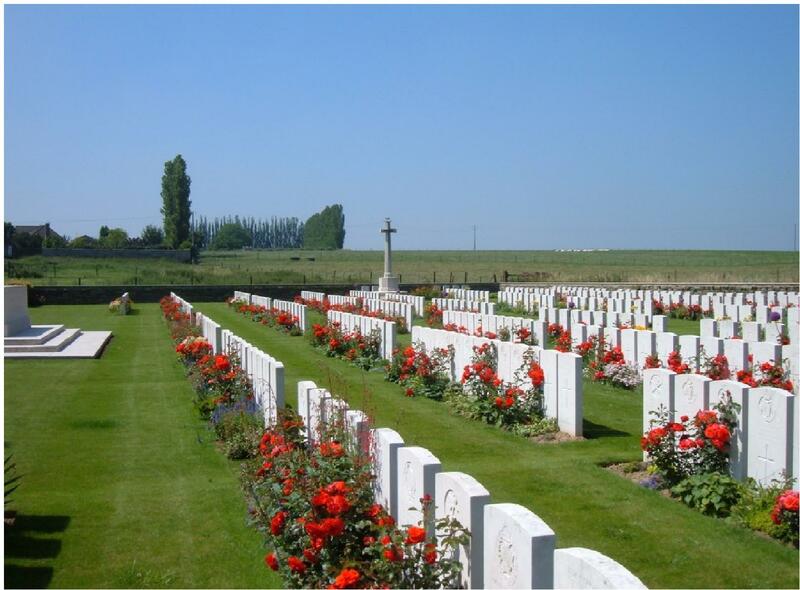 The Commonwealth War Graves website has a plan of the cemetery, alongside this picture, and explains that Moeuvres is a village in France, 10 kms west of Cambrai. So, when Wilfred Turner died on 24 November 1917, it must have been at the Battle of Cambrai. As an important rail centre, essential to bringing in supplies for the German forces, Cambrai became a target for an Allied attack. The Third Army attacked early on 20 November 1917, using a revolutionary method of co-ordinated massed tank-infantry-artillery-aircraft attack on the German trenches. The Germans apparently studied this method very closely and developed it into the German Army blitzkrieg methods of the second World War. At the end of the first day the attack appeared a spectacular success; church bells in England were rung in celebration. The Germans took back most of the ground they lost, however, with heavy reinforcements and an effective counter-attack. Wilfred Turner was just one of the Third Army’s losses (dead, wounded and missing) of approximately 44,000 men between 20 November and 8 December. German losses have been estimated at between 45,000 and 55,000. Wilfred Turner was born at Wolverhampton on 15 June 1882. At the time of the 1891 Census, he was an 8 year old schoolboy. His father, Henry Robert Turner, was a Policeman. Both Wilfred’s father and mother, Martha, were born at Kingswinford. There were 3 more boys, Walter (12), Arthur (10) and Nathan Ernest (6), and a 5 month old daughter, Martha. She seems to have been known as Patty on the 1901 Census. By 1901 at the age of 18 Wilfred was working as a County Court Bailiff. He married Edith Florence Beck on 1 July 1909, and they were living at 14 Bingley Street at the time of the 1911 Census. There is no record of them having any children. Wilfred was ill with Scabies in 1916 for 63 days, from 9th October, until he was discharged as “cured” from the Holb orn Military Hospital Western Road at Mitcham on 11th December 1916. Scabies is a contagious skin infection caused by a parasitic mite, developed in the field during the First World War because doctors had become unfamiliar with its early signs. Apparently many soldiers only reported sick after the condition was too painful to bear. By then the rest of the men alongside them in the trenches were infected, too. Holborn Military Hospital was located in the Mitcham workhouse, used as a military hospital in the First World War, and afterwards to house refugees from the Russian revolution. On 5 July 1918 a letter was sent to Mrs Turner to advise her that she would receive a widow’s pension of 13/9 a week with effect from 22 July 1918. 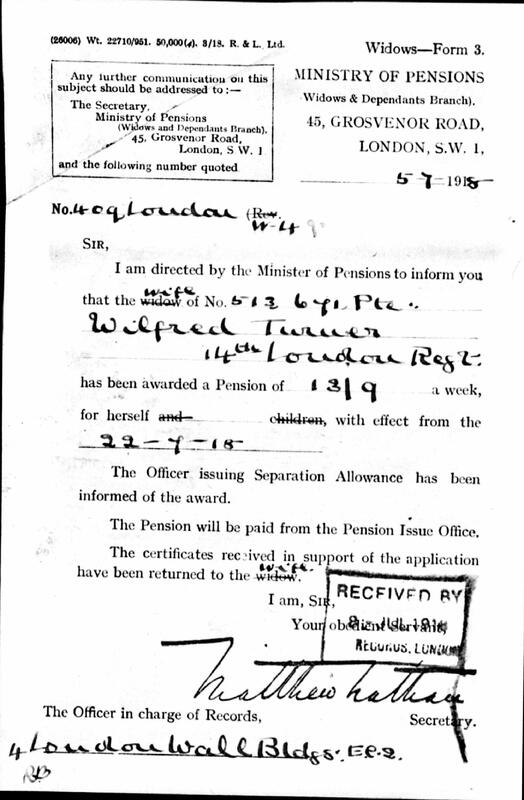 She was referred to as being the wife of Wilfred Turner on the Ministry of Pensions Form 3. Probate was granted to her on 15 May 1919, with Wilfred’s effects being valued at £249 13s 3d. 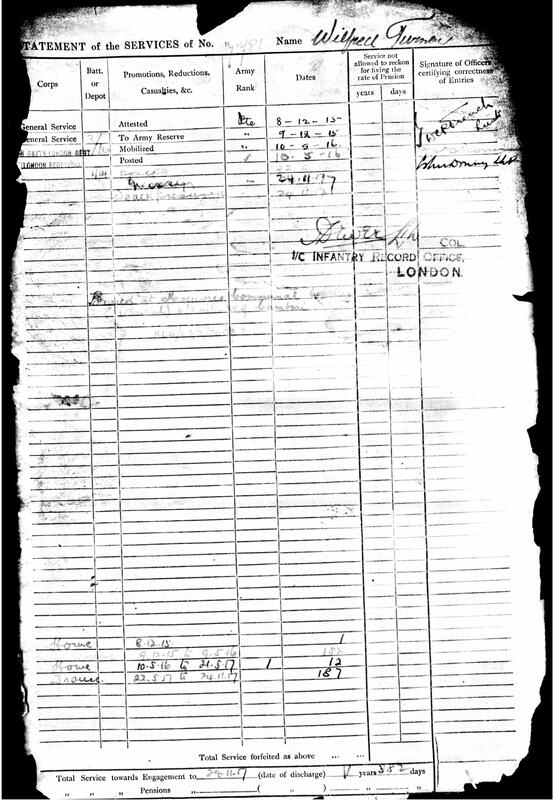 Among Wilfred’s army records this note can be seen.